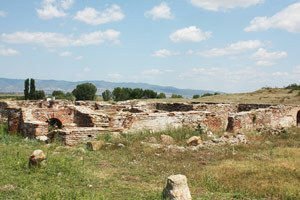 Less than 10 km from Yambol are the ruins of the ancient city of Kabyle. 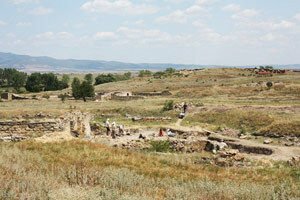 Today the area around the village is treated as an archaeological reserve, which contains incredibly valuable archaeological evidence and remains of antiquity. It was declared in 1965 that Kabyle was the central and most important location at that time, which is a prerequisite today as it is including in the one hundred tourist sites. The ancient village of Kabyle existed around 2000 BC and stayed on top of the peak of Sajchi hill. 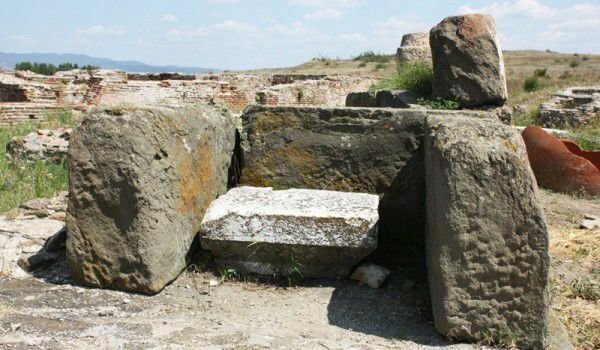 This Thracian royal city is situated on a plateau, crowned with rocky acropolis, which in the past represented a sanctuary-observatory. The plateau is situated in the bend of the river Tunja south to Edirne or as we know it nowadays, Turkey, and it dominates the plain. The city existed some time under the name Dampolis/Diampolis, which means "City of Zeus". Ceramics that were discovered were from the 10th - 6th century BC which proves that the village existed during the early Iron Age. During that time Kabyle was a key point of the path of Aynos (today Enez) at the mouth of the Maritza (ancient Hebros) to Hemus (Balkan) and then lower reaches of the Danube and the diagonal route from the Byzantium through Serdica (Sofia) - Naysos (Nish) which to the middle reaches of the Danube River (Fall 1982). This location determined the fate of the village for centuries. The archaeological material shows that during the 5th – 4th century BC the city maintained important trade relations with the Hellenic cities in the Aegean and Black Sea coast. The city Kabyle occurred even in the pre-Roman era. In 341 BC the city was conquered by the army of Philip of Macedonia, and later entered into the composition of the empire of Alexander the Great. The city is mentioned in ancient writings of 14 authors of which most of them describe the early capture of the city by Philip of Macedonia. In the third century BC Kabyle was part of the territory controlled by the Thracians. Greek author, Lampsak in II century describes the city as chorionic ie, a fortified city, situated in the middle of Thrace to Tundzha. In 71 BC Kabyle entered into the composition of the Roman Empire, having conquered the army of Marcus Lucullus, and after 45 years was part of the Roman province of Thrace. The city then becomes a major military and commercial center in 2nd and 3rd century BC. Kabyle was one of the major cities in this province after the reforms of Emperor Diocletian in the 4th century and was located at the crossroads between the roads Augusta Traiana - Adrianople and Augusta Traiana - Anhialo. The town was built by all the rules of Hellenic cities. Kabyle had the agora square, around which the life in the city was centered. The square was in the temple of Apollo - the Greek god who had good reception among the Thracians. Furthermore, it was in the city and larger temple of the goddess Artemis - Hecate who served and archived documents of the stone city. Itself, Sajchi peak above the city is an open stone acropolis, where the rock relief of the goddess Artemis-Hecate (Cybele), protectress of the city can only be found in Bulgaria. The city had developed a coin-minting and even minted its own coins. Today excavations in the territory of Kabyle continue. 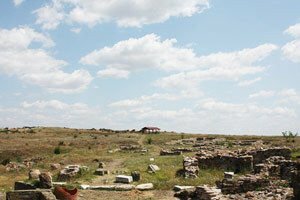 During the summer months working there are both Bulgarian and foreign archaeologists. In the ancient village of Kabyle you can see the remains of many buildings and remnants of walls and the eastern and western gates of the city. Revealed are the central square (agora), public buildings, Roman barracks and a public Roman bath. Interesting is the central episcopal basilica, which is open to a magnificent colorful mosaic which can be seen built in the museum with exhibits and artifacts from the area.